Next week GlobalGiving will be launching the new GG Rewards Program. Here’s a post by Marc Maxmeister that provides a sneak peek into the work that’s gone into conceptualizing, building, and launching the program. GlobalGiving‘s goal is to help all organizations become more effective by providing access to money, information, and ideas. That is a lofty, aspirational goal. To everyone else, it might look like all we do is run a website that connects donors to organizations. But internally, I serve on a team that has met every week for the past 3 years to pour over the data, to find an efficient way to help organizations become more effective. We call ourselves the iTeam (i for impact). GlobalGiving’s iTeam. We try not to take ourselves too seriously. It is hard to move thousands of organizations in one shared community forward. We use gamification, incentives, and behavioral economics to encourage organizations to learn faster and listen to the people in whatever corner of the world they happen to operate. Before 2014 we used just six criteria to define “good,” “better”, and “best.” If an organization exceeded the goals on all six, they were Superstars. If they met some goals, they were Leaders. The remaining 70% of organizations were permanent Partners – still no small feat. Leaders and Superstars were first in line for financial bonuses and appeared at the top of search results. In 2014 we unveiled a more complete effectiveness dashboard, tracking all the ways we could measure an organization on its journey to Listen, Act, Learn, and Repeat. We believe effective organizations do this well. But this dashboard wasn’t good enough. We kept tweaking it, getting feedback from our users, and looking for better ways to define learning. How do you quantify it and reward everyone fairly? The past is just prologue. In 2015, GlobalGiving’s nonprofit partners will earn points for everything they do to listen, act, and learn. This week I put together an interactive modeling tool to study how GlobalGiving could score organizational learning. When organizations do good stuff, they should earn points. If they earn enough points, they ought to become Leaders or Superstars. But how many points are enough to level up? That is a difficult question. We worked with our nonprofit partner Leadership Council to get their ideas, and we also created some data models to help us decide. 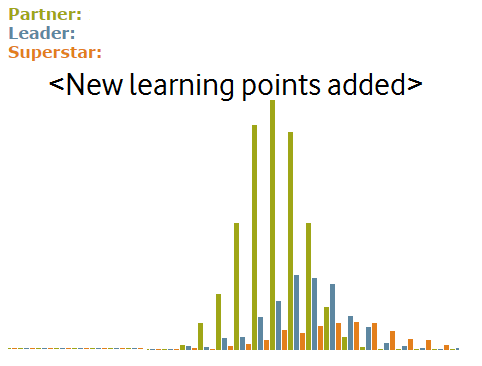 On the x-axis: total learning points that an organization has earned. On the y-axis: number of organizations with that score. There are three bell curves for the three levels of status. It is significant to notice that these bell curves overlap. It means that some Superstar organizations in our old definition of excellence are not so excellent under the new set of rules. Other Partner organizations are actually far more effective than we thought; they will be promoted. Some of the last will be first, and some of the first will be last. And that will change everything. “Learning organizations” will leapfrog over “good fundraising organizations” that haven’t demonstrated that they are learning yet. Not only will different organizations level-up to Leaders and Superstars, everyone’s scores will likely increase. We’ll need to keep “moving the goal posts.” Otherwise the definition of a Superstar organization will be meaningless. This weighting would run contrary to our mission. So obviously, we’re not doing that. But we also don’t want to impose rules that would discount the efforts organizations have made to become Superstars under the old rules. This is a balancing act. Our definition of a Learning Organization is evolving because our measurements are getting more refined, but we acknowledge they are a work in progress. We seek feedback at every step so that what we build together serves the community writ large, and not just what we think is best. Fairness: It is mathematically impossible to make everybody happy when we start tracking learning behavior and rewarding it. Meritocracy: We will need to keep changing the definition of Superstar organizations as all organizations demonstrate their learning, or else it will be meaningless. The best organizations would be indistinguishable from average ones. Crowdsourcing: The only fair way to set the boundaries of Partner, Leader, and Superstar is to crowdsource the decision to our community, and repeat this every year. Defined impact: We can measure the influence of our system on organizational behavior by comparing what the model predicts with what actually happens. We define our success as seeing everybody increase their score every year, and earning more points each year than in the previous year. Success is also seeing a normal distribution (e.g. “bell curve”) of overall scores. Honest measurement: I was surprised to realize that without penalties for poor performance, it is impossible to see what makes an organization great. Iterative benchmarking: We must reset the bar for Leader and Superstar status each year if we want it to mean anything. Community: We predict that by allowing everyone a say in how reward levels are defined, more people will buy into the new system. Information is Power: By creating an interactive model to understand what might happen and combining it with feedback from a community, we are shifting away what could be contentious and towards what could inspire stronger community. We were inspired by what others at the World Bank and J-PAL did to give citizens more health choices in Uganda. What the “information is power” paper finds is that giving people a chance to speak up alone doesn’t yield better programs (the participatory approach). Neither does giving them information about the program alone (the transparency approach). What improves outcomes is a combination of a specific kind of information along with true agency – the power to change the very thing about a program that they believe isn’t working through their interpretation of the data. The model I built can help each citizen of the GlobalGiving community see how a rule affects everyone else, and hence understand the implications of their choice, as well as predict how they will fare. If we infuse this information into a conversation about what the thresholds for Partner, Leader, Superstar ought to be each year (e.g. how much learning is enough? ), this will put us in the “information is power” sweet spot – a rewards paradigm that maximizes organizational learning and capacity for the greatest number of our partners. I predict that giving others this power (to predict and to set standards) will lead to a fairer set of rules for how learning is measured and rewards doled out. It ain’t easy, but it is worthy of the effort. This is our mission at GlobalGiving: catalyzing a global marketplace for money, information, and ideas. In 2002 we began to build an online funding bridge between passionate individual donors—people whose gifts are often seen as too small to be meaningful—and smaller organizations whose impact has been all too easy to ignore because of their size or remoteness of their work. Today that funding bridge has turned into a global marketplace where anyone in the world can support projects and organizations that they otherwise would never have known. But democratizing fundraising was only the beginning. Soon after we started GlobalGiving, we began providing feedback tools. The very same platform that revolutionized access to crowdfunding has also made it possible for us to collect and share information with our nonprofit partners. We soon found we could offer nonprofits the kind of feedback tools that would dramatically improve the quality of their fundraising. We saw that our partners were hungry for this type of feedback, and they were eager to respond rapidly to new information if it helped them improve their work. Today, more than 2,000 of our nonprofit partners use our feedback tools to improve their fundraising. In 2011 we introduced the Partner Rewards system. Similar to an airline’s frequent flyer program, we give our nonprofit partners points for increasing their engagement with our platform and our feedback tools. Higher Rewards status (partner, leader, and superstar) translates to more visibility on the site (like being featured on our homepage, or our social media), and makes us more likely to refer an organization to our corporate partners. That extra visibility translates to more donations for projects. In the same way that you might be motivated to purchase your next ticket from United because you’re only 1,000 miles away from Gold Status, we found that Partner Rewards levels motivated nonprofit partners to write that extra project update, or to rally a little harder for a campaign, because it would take them to the next level, ultimately driving more funds to their project. Our Partner Rewards Bonus Days are a great example of this. In June 2012 we introduced our first Partner Rewards Bonus Day where we offered different matching percentages for different rewards levels (donations to Partners were matched at 30%, Leaders at 40%, Superstars at 50%). One way for organizations to bump up their status is to submit a project report to fulfil the quarterly requirement. We saw a great increase in the number of partners submitting reports that month in order to qualify for the higher statuses. Clearly, the Partner Rewards System was a compelling incentive to drive behavior. 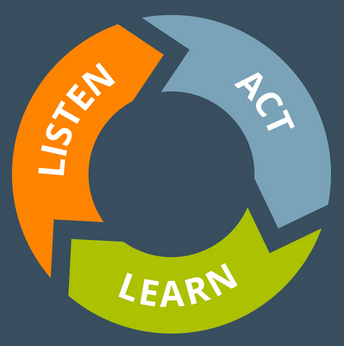 The cycle of progress: Listen, Act, Learn. Repeat. Listen: we can help nonprofits access feedback from the people they serve, share best practices, and discover new ways to improve performance. Act: we can provide training and one-to-one consulting to help each partner experiment and try new ways of working. Learn: as they try new ideas we can offer them feedback on how well it is working for the people and causes they serve. Repeat: once they achieve the results they are hoping for, we can help them integrate the new way of working into their operations, so the improvement is sustainable. While many of our nonprofit partners join GlobalGiving for the access to financial resources, they stay and thrive because we provide something that is just as vital to their mission: access to knowledge. We can use our web platform and powerful incentives (money!) to drive learning, and ultimately, higher performance. This dashboard is in MVP (minimum viable product) stage of the build-measure-learn product development cycle. Initially the majority of the opportunities to earn points have focused on fundraising effectiveness, but in 2014 we integrated several external feedback tools into the dashboard, allowing our partners to earn points for listening, acting, learning, and repeating that cycle on the ground. In 2015 we’re focused on integrating the elements of the Effectiveness Dashboard into our main Partner Rewards ranking and search algorithms on GlobalGiving. Our partners are motivated to improve their Partner Rewards status, because it translates to more funding for their work. We believe that it will also translate to higher performance on the ground that is informed by feedback and data about what works in their communities. This is how the Effectiveness Dashboard is a powerful tool to help us align fundraising with performance, by channeling more funds to the nonprofits that demonstrate the greatest commitment to improvement, and have the highest potential to do the most good.